James Fenimore Cooper popularized him. But the first Frontier bestseller, the granddaddy of them all was 'Atala", written in 1800 by the French catholic writer Chateaubriand. "Atala" inspired countless paintings and plays and tells the tragic story of a young Indian princess Atala who takes poison to protect her virginity rather than succumb to the ardent courtship of Chactas, a handsome Indian of the Natchez tribe whose only crime is that he has not embraced Catholicism. There were many other European writers of 'Westerns" in the nineteenth century - Mayne Reid, Friedrick Gerstaecker, Gabriel Ferry. Most of their books are Boys Own stories in which a young European, sowing his oats and looking for adventures in exotic climes, comes to America and absent-mindedly is plunged into the rescue of a damsel in distres. The locale is usually New Mexico or Arizona, which the author may or may not have actually visited. In most of these European versions of the dime novel Indians are savages and intrinsically evil, reflecting a general. prejudice against colored racesby Europeans who saw the Red Indian as just one more obstacle to the great God of Progress. This was an almost universal view. Charles Dickens, for example, described the Native American as "a savage..and I call a savage something highly desirable to be civilised off the face of the earth." But in Germany the tragic fate of the American Indian only made him more attractive. 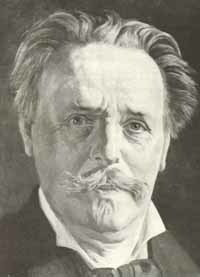 Mythology and Romanticism reach their climax in the wonderful series of "Winnetou and Old "Shatterhand", novels by the Saxon author Karl May (pictured above) first published in Dresden one hundred years ago. Ask any German today to name one American and he or she will nstinctively say 'Winnetou' or 'Old Shatterhand',not Lincoln or Washington. In his dozen or so Winnetou novels, May created characters who have become living legends, for millions in German-speaking central Europe an escapist reality that they still believe is a true representation of the real America. Yet the astonishing fact is that Karl May never came to America until just four years before his death, that all these books were written on the basis of travel books, anthropological guides to the fauna and flora of the Southwest, and that they're basically a retelling of good old German myths about Good versus Evil, transposed to Arizona and Colorado. Winnetou is a good Apache who becomes the blood brother of Old Shatterhand, a German writer who can kill a man with a blow of his fist and incarnates the virtues of a good Christian who prefers mercy to murder. They ride up and down the West righting wrongs and thwarting evil. Winnetou is eventually murdered by Yankees lusting for buried Indian gold. According to May's maps Winnetou is buried in the Grand Tetons. Many is the German who has made the pilgrimage to Wyoming in search of the rock pile he believes marks the burial mound where Winnetou is believed to sit astride his faithful steed Iltsche.